Dr. LeBeau today announced that they will now offer the ARTAS® Procedure, a minimally invasive hair restoration solution that leverages digital imaging and precision robotics for harvesting individual follicular units directly from the scalp, in Pensacola, Florida. The ARTAS System enables hair restoration physicians to target and harvest healthy follicular units with micron level accuracy without leaving a linear scar.As the premier center for aesthetic hair restoration, the LeBeau Clinic will be the only location on the Gulf Coast offering the advantages of robotic assisted hair transplantation. “Offering the ARTAS Procedure will be essential for my practice and for my patients who seek a permanent solution to hair loss without the scarring and downtime that comes with alternatives in the market. I’m extremely pleased with the results and excited to offer a robotic solution to hair restoration,” commented Dr. LeBeau. Hair restoration is performed as an office-based procedure. Implanted hairs develop their own blood supply, begin to grow and new hairs are seen a few months after the procedure. New hair continues to grow, making the change in the patient’s appearance gradually noticeable within six months. “We are very excited to have a talented hair transplant surgeon like Dr LeBeau in Pensacola, Florida offering the most advanced hair restoration solution that is safe, minimally invasive and extremely effective,” said Jim McCollum, Chief Executive Officer, Restoration Robotics. Over 35 million men are affected by male pattern baldness (androgenetic alopecia) in the United States alone. Approximately two-thirds of American men will experience appreciable hair loss by age 35; by age 50, 85% will see significant loss in hair thickness. Genetic hair loss, which typically begins between late adolescence and before or during middle age, is largely untreatable outside of surgery. Dr. LeBeau belongs to a select group of American surgeons who are triple board certified (American Board of Facial Plastic & Reconstructive Surgery; American Board of Otolaryngology-Head & Neck Surgery; American Board of Laser Surgery) and has completed a fellowship under the former president of the AAFPRS. Dr. LeBeau is from a lineage of medical professionals and has been awarded national, regional, and local accolades for his skill in aesthetic and cosmetic medicine. His medical degree comes from the Drexel University College of Medicine. Restoration Robotics, Inc., a privately held medical device company, is dedicated to revolutionizing the field of hair transplantation by developing and commercializing its state-of-the-art image-guided ARTAS® System. This interactive, computer assisted system uses image-guided technology and a robotic arm to enhance the quality of hair follicle harvesting for the benefit of physicians and their patients. 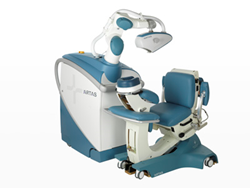 To learn more about the ARTAS System and its unique technology, visit http://www.restorationrobotics.com or http://www.artashair.com.